When I told my boss I was going to see, “A Serious Man,” he said, “Well you better see it with a Jew. Otherwise, you’ll be lost.” I assured him I’d grown up in a mostly Jewish neighborhood and was, in fact, a Shabbat goy in my youth. (A Shabbat goy is a non-Jewish person who assists with certain sorts of restricted chores, such as turning on or off electrical things, on the Sabbath). 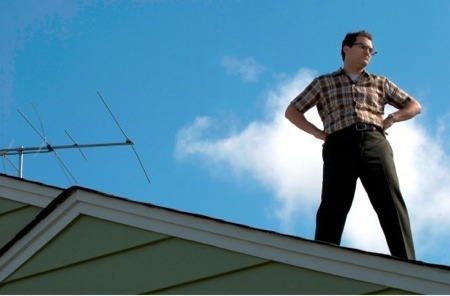 My boss was right though; my role as a Shabbat goy was not preparation enough for me to get all of the references in “A Serious Man.” But being alive in 2009, carried me a long way toward understanding this funny yet dour film. I’d make a guess that after more than a dozen films, the Cohn Brothers have finally leaned heavily on their own roots in this one. Now that they’ve done their “take” on every genre, it felt like the right time to tell a story closer to their heart. Or so I would guess. PLOT: It is 1967 in a Levittown-type suburb of Minneapolis and Larry Gopnik (Michael Stuhlbarg), a university physics professor is about to be tested, much as his antecedent, Job. A serious man, as the title suggests, he’s allowed little room in his life for the unexpected. In quick succession, his wife (Sari Lennick) leaves him for a slimey colleague (Fred Melamed), he’s subjected to bribery attempts by a student (David Kang), his land is encroached on by a noisome, anti-Semitic neighbor, his kids get into all sorts of sixties’ hi-jinks, his university tenure application is shaky at best, his brother (Richard Kind) is a constant headache. Gopnick consults three rabbis in wrestling with his sudden downward slide. But their advice amounts to little more a shrug. Religion offers no more answers than the rest of us despite hiding behind mysticism. The ending of the movie is as enigmatic as its beginning. The only thing that remains is the unpredictability and unfairness of life. “A Serious Man” is much funnier than it sounds in this description, but it is not a happy story. It is clever, true and wise. Something tells me that a Jewish story, true to its roots, could not have a happy ending. It is a highly-skilled and watchable movie though. You want Larry to climb out of his hole. But since it’s a Jewish tale, you know what the likelihood is.